Mankato, Minnesota, 2012. 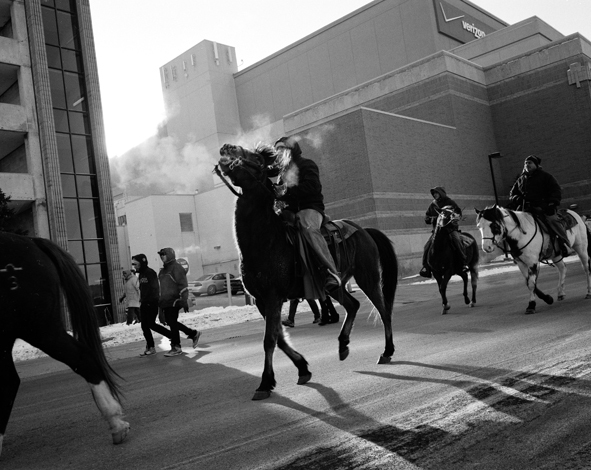 On the morning after Christmas, Sioux riders enter the town of Mankato, Minnesota to mark the 150th anniversary of the execution of thirty-six warriors who were hung in the center of town in 1862. The hanging, which remains America’s largest mass execution, ended a rebellion by the Dakota, who were starving after promised provisions never arrived on the reservations. Minnesota settlers were so traumatized by the uprising that even today, it is illegal for the Sioux to be in the State. Queens, New York, 2010. It is estimated that over 12 million Africans were kidnapped and forced onto ships headed to the New World as slaves. Millions died on the journey. Every year, St. Paul’s Community Baptist Church in East New York, Brooklyn, remembers this holocaust by offering a prayer to ancestors who died on the slave ships crossing the Atlantic Ocean. Hundreds of parishioners, wearing white, attend a dawn ceremony at the edge of the ocean in Rockaway Beach, Queens. Galveston, Texas, 2010. With the Emancipation Proclamation, President Abraham Lincoln declared slaves in the Confederacy to be free as of January 1st, 1863. This had little effect for the vast majority of America's slaves, who still lived under Confederate control. In Texas, the slaves had to wait until June 19th of 1865, when a Union General read the Proclamation from the balcony of a Galveston mansion. By combining the words "June" and "Nineteenth", local black families made the event a festive holiday to celebrate their freedom. Today Juneteenth is the oldest known event commemorating the end of slavery in America. As part of the Juneteenth celebrations, the Emancipation Proclamation is still read every year from the same location in Galveston, Texas to local residents. Sturgis, South Dakota, 2011. Throughout his short life, Bear Butte, on the northern edge of the Black Hills, was a place of refuge for the Sioux warrior Crazy Horse. It was on this hilltop, jutting out of the Great Plains, that both the Sioux and Cheyenne believe that the Creator handed down the laws that governed their nations. And it was here that Crazy Horse climbed to receive his vision, which was to dedicate his life defending the sacred hunting grounds of his people. 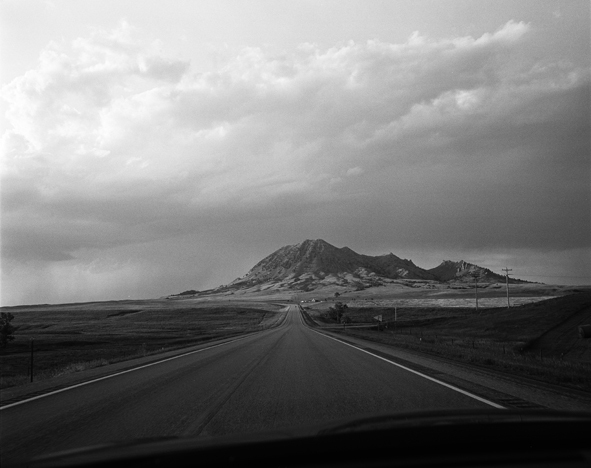 Today, Bear Butte is located only a few miles from the biker bars of Sturgis, South Dakota. While the butte is covered in prayer flags, left by visitors from the reservations to the east, most Americans are more familiar with the reality television show being filmed just down the road at the Full Throttle Saloon. My decision to become a photographer has been directly shaped by my fascination with history. The best pictures age with time, and become historical documents in their own right. When I began the American Memory project I sensed that the search for images could lead me to places where I might be able to witness history in the making, rather than just reading about it. Like any country, what we choose to honor and celebrate in America, or forget and ignore, reveals who we are. In traveling across the country, selecting historical sites to photograph, I’ve been interested in a history of violence and conquest, and the struggle for freedom and equality, because I see these themes as still with us today. History is all around us, in the air we breathe, and it is very much alive. Calling attention to the injustices of the past, for me, is important because ignoring them can be worse than the original crime committed. It is from these denials-of the cruelty of slavery, of the Indian genocide, of the violence used to suppress the labor movement-that allows those same injustices to continue today. I’ve always believed that the first step towards healing a wound is acknowledgement. Without that, it is impossible to move forward. American history is neither just about men and women seeking freedom from tyranny or a tale of racial expansion written in blood. Like all nations, both, and everything in-between, have existed, often at the same time. History is a constant back and forth struggle between generosity and greed, hidden power and democracy, a confusing muddy- gray swirl of lives well lived and others abandoned, snuffed out before their time. What does make America unique is our belief in our own national myths-that this city on a hill is truly exceptional and apart, untainted by the evils and corruption of the old world. This disparity between what we say and what we do has been America’s great weakness, and the source of her power. It makes us hypocrites, but propels us forward and gives us a set of ideals that we are always struggling to live up to. As an American, it was both the cruel realities of this nation’s past, and her ability to constantly strive to do better, that inspired the American Memory series of photographs. Laatikkomo’s interview with Andrew Lichtenstein August 22nd, 2014. AL: I was born in New York City, and I’ve lived in Brooklyn for the past 26 years. Unfortunately, this does not make me a very well travelled person, but one of the advantages of living in New York is that the world comes to you. AL: I remember the very first time I made a photographic print in a friend’s bathtub. I must have been about fourteen. We had no idea what we were doing, but the thrill of the image emerging in the developer tray has stayed with me. It was a picture of my father, who looked somewhat like Fidel Castro, wearing an army cap. L: As a documentary photographer and journalist, what photography project has made the greatest impact on the way you photograph people? AL: In my early twenties I walked with a large group of homeless people on a protest march from New York City to Washington DC. It took us three weeks, and we stayed in shelters or church basements along the way. That was a long time ago, but I still remember it as a very influential trip. That was where I learned to have a conversation with a photograph. L: Your photographs show so many facets of American life and landscape, that they could easily have been taken in different countries. Have you found something that unites these places and events apart from the name, which conglomerates the territory called the United States? AL: Well, simply put, yes. 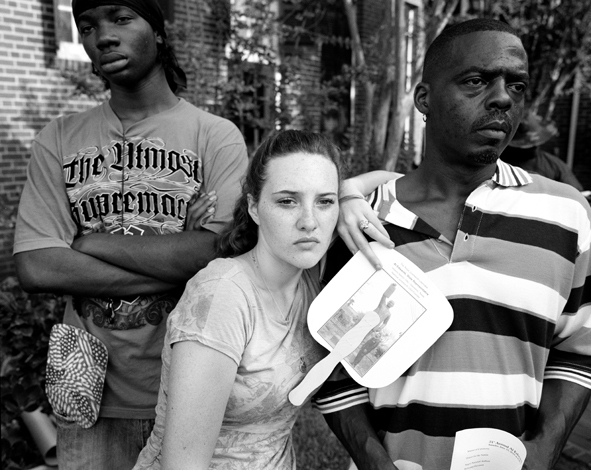 I’ve chosen, for many reasons, to focus on documenting America. Obviously that is too large a task for one individual, so maybe I should just say that I find my inspiration in photographing my own country. The images here are often less graphic, less immediate, than in many other parts of the world. There are layers upon layers of lawyers and public relations hacks and rules and restrictions to deal with, but America is a fascinating, unique place. In terms of such basic institutions as our health care or criminal justice system, we really are a ‘third world’ country. L: The position you take as a photographer seems to be that of a fly on the wall. How do you control your own personal opinions when photographing a subject? Or do you? AL: I don’t. I believe that having a personal point of view as a photographer is not only essential, but the very reason for bringing along a camera in the first place. L: You talk about actively observing and participating in the making of history. What (hidden) histories have you observed recently that have the potential of changing the history of your country? AL: By participating in the making of history, I mean selecting historical events that have been ignored or forgotten to photograph-not as a active participant in a historical narrative. History is what we choose to make it. Like photography, the choices are made in the editing. L: How do you choose the subjects/issues/locations that you photograph? Do you set out with an idea of what issues you would like to photograph, or do your subjects surface as you work? AL: I sometimes joke that the only reasons to be a journalist are a few free parking spaces and an attempt to right a wrong. It is the pursuit of these two goals, however distant and elusive that they remain, which keeps me inspired. L: Alongside your harsher projects depicting excerpts of everyday life, you also take serene images of landscapes. Is this landscape project directly related to your research on American history? Do you also see this as another kind of hidden history? AL: I’ve been told by other people that the landscape series is related to some of the other stories, but I personally do not see a connection. I simply love to be in the wilderness. It is where I feel at peace. Sometimes I bring along a camera, though I admit to not really being interested in ‘nature’ photography. But it is one of the great joys of living in America, to have access to this wonderful variety of landscapes, from rainforest to desert and everything in-between. L: Could you list a few words that you were thinking about when you made this work? AL: When I was working on the photograph of the Sioux returning to Mankato on horseback, I was really just focusing on the exact moment to take off my gloves and try and make a photograph. It was so cold, I remember the temperature being about zero degrees (fahrenheit). I did not a lot of choices to make a photograph, because my hands would freeze with my gloves off, and it had been a long trip to get there, traveling over Christmas Day. That’s why I like the photograph. I can still hear the sound of the shutter of that one frame.